Today I have a secret recipe from Panda Express. This tasty Chinese dish is a delicate combination of chicken, mushrooms and zucchini that’s wok-tossed with a light ginger-soy sauce. Serve this dish with steamed white or brown rice. Today I have a secret recipe for an Szechwan-inspired dish served at Panda Express Chinese Kitchen. 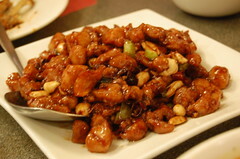 Kung Pao chicken is a spicy and flavor-packed dish with chicken, peanuts and vegetables, finished with chili peppers. Serve this with steamed white or brown rice. Combine the chicken, 1/4 cup water, 1/2 teaspoon salt, 1/2 egg, 1/4 cup cornstarch and 2 tablespoons of vegetable oil and refrigerate at least 1 hour. In a small bowl add the wine, soy sauce and water and set aside. Heat wok/skillet on high heat 10 seconds, you want that pan to be nice and hot! Remove chicken from marinade and add to wok, cooking on high heat for 60 seconds. Remove the chicken from the pan, add another 1/2 tablespoon of oil and the red bell pepper and zucchini. Cook on high and cook for 1-2 minutes, until just caramelized and slightly cooked. Remove vegetables and add the chili peppers. Stir until they darken a bit, then add the green onions, peanuts, ginger, garlic, crushed red pepper, and sesame oil. Stir for 2-3 seconds and immediately add the wine/soy/water mixture. Bring it to a boil, then add the cornstarch and water mix and stir until it has thickened. Add the chicken and vegetables back in, stir to combine. Today I have a secret recipe for a tasty dish served at Panda Express Chinese Kitchen. 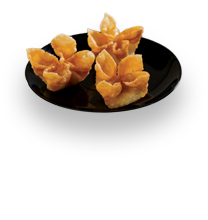 This wonderful dish features large tempura-battered shrimp, wok-tossed in a honey sauce and topped with glazed walnuts. This creates and irresistible combo of sweet and crispy goodness. In a small saucepan, add the water, sugar and walnuts and bring to a boil. Boil for two minutes and remove the walnuts and place on a dish to dry. Whisk the egg whites until they are foamy then add cornstarch and continue whisking until well combined. Add the shrimp to the batter and one at a time using a fork pick up 1 shrimp at a time allowing it to drip off so that the shrimp has a thin coating and maintains it’s shape. Heat the oil in a medium sized pot on medium high (350 degrees F) and fry until light golden brown, 4-5 minutes. Add the fried shrimp to the sauce and coat with a large spoon. Place into your serving plate and top with the candied walnuts. Optionally you can top with sliced scallions.